We make LS conversion wiring systems and tune’s compatible with any GM model car or truck. The cluster below can be found in the 2001-2002 Cadillac Escalade equipped with the LQ4 (6.0) high output engine, or any engine you choose. Speed Scene Wiring can integrate this GM cluster in your street, rock crawler, or project vehicle. If you have a stock TBI fuel injected truck or an S10, with central port injection (CPI) and want to change the engine to an LT1 or LS1. Speed Scene Wiring will marry the two harnesses together to make one. We recommend this way, due to the fact that if the harness is not converted properly. The dash, four wheel drive, ABS and on board computer may not function as they previously did. Specific body computer systems need to remain. So it’s not uncommon to run 2 computers, one for the body, and the other for the engine fuel management system. We can also take your 1995 Corvette LT1 wire harness and convert it to LS1 or LS2, the choice is yours. 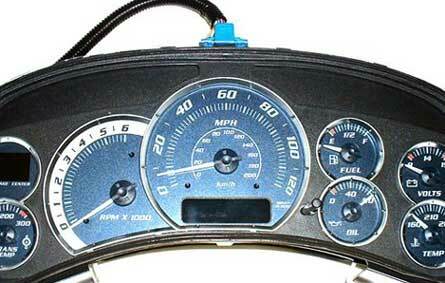 Another popular wire harness conversion is the Caprice or Impala SS LT1 or L99. We can also convert the harness and operating system to LS1 or any of these variations. In most cases you will need 2 wire harnesses to complete a conversion properly, the factory wire harness and the new engine harness of choice. We can custom make the wire harness to lay into your existing factory wire harness. LS2 GTO Body Wiring System. Speed Scene Wiring has crafted entire body wiring systems, and integrated complicated body components. Simply start your engine, enjoy to smooth sound of your LS2 power plant, and the superb drive-ability. The above wire harness on the left is the LR4 4.8 engine converted to 2002 LS6. Conversion costs start at $2500.00. We often require the use of donor wiring and computers, provided by the customer. In many cases, we will need to see the work to quote the most accurate price.